In the last ten years we have developed much more efficient solar panels and batteries, and now we have come so far with this that we can now power our progress, cities, cars, houses and gadgets cheaper and way more sustainable just with solar power alone, than with the steel straws we use to pin deep into our planet – We have finally reached the point where sustainable energy outperform the destructive forms of fossil energy that are creating all the damaging effects on our planet, both its climate, its health and our well-being on the land and in the cities. The best part is that there are deserts enough to power all our needs, solar power are so powerful now, that we only need a tiny fraction of desert land to power whole countries in sustainable ways. The only ones not happy about this are the gigantic fossil fuel interests, that have made a living from selling coal and oil. At the moment they do all they can to stop and lobby who-ever can be bribed from using any alternative to their oil and coal products. But the odds are not in their favor and soon they will have the sun in their eyes. Not only is solar power now the cheapest energy source, but other sustainable sources of energy are also becoming cheaper than fossil fuel, sustainable energy forms like wind and thermal energy, that can supplement solar power in places where these other renewable energy forms are a better fit. Only a few years ago most of the world mainly needed energy for cooking, lightning and heating. Connecting to others was in most of the world done mainly face to face, and transport was not that important as most people would live so close to all that mattered to them that most of their trips would be on foot. Going into town was only done rarely, once in a while to get a few of the things most badly needed or to make a telephone-call from one of the telephone-kiosks, to be able to reach far away relatives, directly, instead of by sending a paper letter. In the most highly developed parts of the world, the reality was more comfortable, but still face to face was the most used contact, letters had to be written and distances had to be traveled to connect. The growth of energy used for communication, entertainment, and other screen-based digital activities has exploded in the last 15 years, leaving the traditional uses and distribution of electricity behind. In the last few years he traditional wired solutions for anything from phones to computers, loudspeakers and toothbrushes are being replaced with battery-powered, wireless, Bluetooth connected solutions, where everything has an app, is connected to the cloud, is personal owned and use so little energy that, in many parts of the world, everyone’s personal phones and screens can be powered by a personal solar panel, attached to a battery (powerbank) that will catch sun enough to power up and make possible a personal digital connection to the rest of the world through the world wide web. The traditional difference in material wealth is growing rapidly, while the digital difference between the most well-off in the world and the poorest, paradoxically are getting smaller and smaller. Anybody from American politicians, to an Indian movie-stars, to a goat farmer in Siberia, or the CEO of Apple, Google or Microsoft are on equal foot and have the same kind of profile on Twitter, Facebook and Instagram. More and more of our reality and focus are on what our screens show and connect us to. And less is on all the stuff we used to spend energy on, just a few years ago. And on the most expensive cruise-ships in the world, the super rich do exactly the same, bring their phones with them as their most important possession. Using it for the same things and tuning into the same social media, watching the same cat-videos, digital kick and storytelling, updates from who won the next football match or what happened in other stories they follow. For the environment, the planet, the future and for our need to stop destroying the planet, it is very important that the world is moving toward a shift to sustainable energy. The strange thing is how this is happening today. It is happening as a change in the ways we see, use, understand and power our reality on a global scale. Today machines are taking over and optimizing the energy used on still more of the non-digital activities, we used to spend a lot of our energy on: farming is handled by huge, energy-efficient, self-driving machines, food stored and shipped through automatic warehouses, and distributed to us in the most rational and least energy-using way possible, with as little interference by humans as possible. Both for profit, health, speed and logistic reasons. We don’t need to spend our own energy to wash our clothes, drive our cars, heat our houses , or fish, or hunt, or collect anything. Machines and processors will take care of all of this for us now. And they will optimize these processes to use as little energy as possible, producing as much as possible. 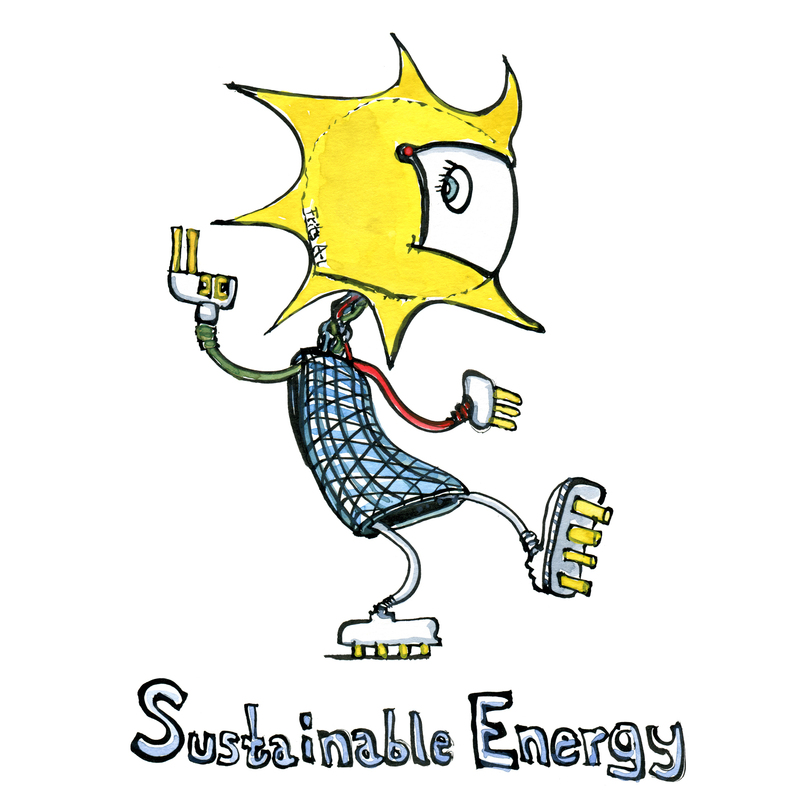 And as solar energy and other sustainable energy-forms are now becoming the cheapest and most rational to use, sustainable energy is what the machines will choose to power themselves on. Today the most important use of energy for us humans is no longer about cooking, heating and lightning. Instead it is about communication and storytelling. We are moving our reality online, to the digital clouds, with our stories mirrored on screens that can be better powered by sustainable energy, like sun and wind. Energy that can both be caught through huge non-destructive energy-farms out in the deserts, or on small portable, personal solar-catching units. If sustainable energy can make it possible for us, without destroying the planet, to connect to anything, from anywhere, it might set us free again, to roam the planet as nomads together, connected through our storytelling in the clouds, while the computers and machines take care of the rest in more sustainable ways than we managed to do.